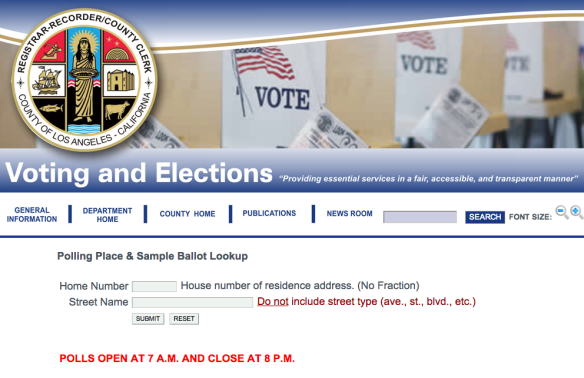 Click above to find your polling place. As you may have heard, there’s a runoff Tuesday in Los Angeles to elect the next mayor of the second-largest city in the nation — a city with about 3.8 million inhabitants and some well-known transportation challenges. I ran the following post on March 4, the day before the primary election in Los Angeles. I’m running it again today as a reminder to vote in tomorrow’s mayoral election between Eric Garcetti and Wendy Greuel because whichever succeeds Antonio Villaraigosa will likely have a hand in many important transportation decisions, including project acceleration, the future of congestion pricing projects, the construction of five rail projects and possible changes in Metro’s fare structure in the future. Metro is a county agency and is overseen by a 13 member Board of Directors who serve as the deciders on most significant issues. The Mayor of Los Angeles gets a seat on that board and gets to fill three other seats with his appointees. A majority of the Metro Board — i.e. seven votes — is required to approve most items. Four of those seven votes are controlled by the Los Angeles mayor. That means that the mayor controls more than half the votes needed to approve items that have impacts across Los Angeles County and the region. •There is the not-so-tiny issue of whether to accelerate the building of Measure R projects and, if so, how best to pay for it and which transit and road projects are included. The next mayor may also choose to use their bully pulpit to persuade Congress to adopt the full America Fast Forward program, which would greatly expand funding for transportation projects. •Although Metro CEO Art Leahy has already said there will be no changes to Metro’s fares in the upcoming fiscal year that begins July 1, he also said it’s an issue that will likely have to be revisited sooner rather than later in order to help Metro keep up with its expenses. If you’re one of the readers who has left countless comments on this blog calling for free transfers or some type of distance-based fares, then this might interest you. •The next mayor will have key votes on the awarding of contracts to build the first phase of the Purple Line Extension and the Regional Connector. Those contracts will total more than $3 billion going out the door. •In addition, Metro will soon release its staff recommendation for a contract to build the $1.76-billion Crenshaw/LAX Line. A vote could happen as soon as June when Mayor Villaraigosa is still on the Metro Board. If the vote happens after July 1, then Garcetti or Greuel will be among the deciders of who gets the contract. The big issue is whether any of the firms that bid on the contract can, as Metro has requested, build a Leimert Park station within the project’s existing budget. If not, the Metro Board will have to decide whether to build the project without the station or where money can be found to build it. In addition, there is the additional issue of whether the next mayor pushes to have the line moved from street level in Park Mesa Heights to underground and, if so, how to pay for it. Members of the local community are pushing for it. •Speaking of LAX, how exactly will it connect to Metro Rail and the Crenshaw/LAX Line? By light rail? Bus rapid transit? People mover? And how will the Airport Metro Connector be funded, given the cost is likely to be more than the $200 million allocated by Measure R to the project? •By 2015, there could be five Metro Rail projects under construction or in the testing phase simultaneously — the Expo Line Phase 2, the Gold Line Foothill Extension, the Crenshaw/LAX Line, the Regional Connector and the first phase of the Purple Line Extension subway. The Metro Board will have to deal with any significant issues that arise or are ongoing, such as the four lawsuits brought against the subway project by the city of Beverly Hills and the Beverly Hills Unified School District. Metro has previously only had two rail projects underway at the same time — when the building of the Eastside Gold Line and the Expo Line overlapped. •The ExpressLanes one-year pilot program is well underway, now that the lanes are open on both the 10 and 110 freeways. When the pilot program is done next year, the Metro Board will get to decide what to do next with the congestion pricing experiment — continue it, change it or scrap it. •The Board will also have to decide whether to go forward with a public-private partnership to go forward with a project that would add a congestion pricing lane in each direction of the 5 freeway through the Santa Clarita Valley. Tolls from single motorists and vehicles with two occupants in peak periods would be used to re-pay a private firm that would advance the money to accelerate the project so that it’s complete this decade. •Speaking of PPPs, Metro is also exploring using one to accelerate the Sepulveda Pass Transit Corridor project — a project that would greatly expand transit between the San Fernando Valley and the Westside. What kind of project and whether it should be PPP — two big decisions that will likely land in the lap of the Metro Board in the next few years. •The SR-710 Study. The environmental study for this project is scheduled to be completed in a couple of years and then the Metro Board will have to decide which alternative to pursue: the no-build option, traffic signal and intersection improvements, light rail, bus rapid transit (both light rail and BRT would run between East L.A. and Pasadena) or…a freeway tunnel. •The future of Union Station. The current schedule has the Board voting next year on a master plan concept to pursue to make the station more user-friendly and expand it to accommodate high-speed rail in the future. •And, finally, the mayor gets to nominate a general manager of the Los Angeles Department of Transportation, which operates the DASH bus service and also controls the traffic signals on roads used by many Metro buses and trains. LADOT is also in charge of the city’s bike program that is creating links to existing and future transit stations. You don’t need me to tell you these are big and important issues that will impact mobility in the region, not to mention the area’s economy and overall livability. If these issues impact you — and really, they impact everybody — then please vote tomorrow if you’re a city of Los Angeles resident and have not already cast a ballot by mail. RELATED: Here’s an L.A. Times survey from March of Garcetti’s and Greuel’s views (and the other leading candidates at the time) on particular transportation issues. If the last local election is an indicator, majority of the people don’t care and turnout again will be very, very low. The Green Line opened in 1995 so its construction overlapped the building of the Red Line past Alvarado. And NOT ONE PROPOSAL TO EXPAND BUS LINES! WHY NOT? And you wonder why L.A. residents DO NOT VOTE? Great article! I had no idea of the majority of these mayoral powers. Time to post a link! I voted…but the bad news is that the polling place that I went to was pretty deserted. Election workers were pretty bored because there was very little to do. Either that or most people did it via mail-in ballot. I doubt it. I have to agree, it seemed to me at least, that the people just don’t care that much about local elections.